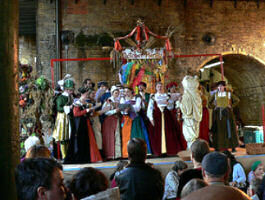 the Lions part are now the proud owners of a purpose build pageant wagon as used by the Medieval Mystery players. 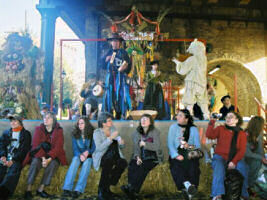 It is available for hire to local groups and is a wonderful resource for performing, speaking, processions or outdoor events. 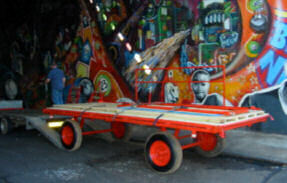 The cart is 15' long by 7'6" wide and can be drawn by either one or two horses or a vehicle. It is 3' high and can extend forwards to make a stage 15' wide by 10' or 13' deep. It has two sets of steps, a guardrail along the back and an 8' high frame that can take a backdrop. 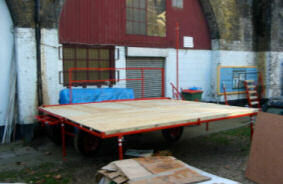 The cart is red and the stage is light coloured plywood finished with a natural hardwax oil. It can be towed at a maximum speed of 20 mph behind a vehicle, and is light enough to be manoeuvred (when empty) by 2 people. The cart can be hired locally, at a competitive rate starting at £300. Full safety details and conditions of hire are available on request. It is stored in Bermondsey and is ideal for use within a radius of about 10 miles, although it could be used further afield if transported by a low loader. Hirers must agree to abide by our Health and Safety Policy and Instructions for Use and should arrange their own insurance cover. 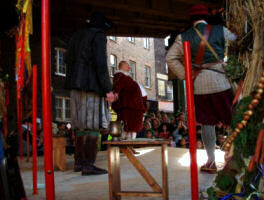 We performed Syr John Falstaff in Love, a version of Shakespeare's The Merry Wives of Windsor, on the cart stage on 29 October 2006 as part of our October Plenty festival. See www.thelionspart.co.uk and www.flickr.com and search 'october plenty'. To hire the cart, please contact Duncan Law on 07958 635181 or . 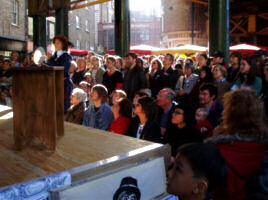 Below are some pictures of the cart in use as a 15x10' stage at the October Plenty festival.